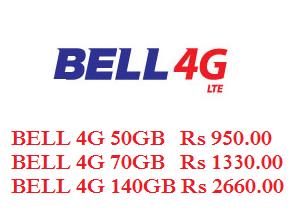 Now Bell 4G introducing new most cheap internet packages for Sri lankans. Bell 4G Broadband packages provide reliability, uninterrupted connectivity and experience speed that offer better value for your money. Competition within the broadband providers in Sri lanka, Bell 4G increasing their Data bundle yesterday. Now you can get Cheapest Internet from Bell 4G.